Our company is highly esteemed in offering Men's Denim Short to the clients. To meet variegated demands of our esteemed clients, we are engaged in manufacturing an exclusive range of Men's Denim Shorts. We hold expertise in this domain and are indulged in providing an optimum quality range of Men's Denim Shorts to our esteemed customers. These Men's Denim Shorts are popular amongst our clients due to its features like splendid looks and supreme quality. Offered products are also available at economical prices. Our company holds immense experience in this domain and is involved in offering wide assortment of Men's Denim Shorts. Giving a naturally worn in look with its faded wash, these mid blue dyed denims from Spykar give the perfect slim cut tailored fit. Featuring an interesting back pocket detail and a stylized back yoke, these comfortable denims come with belt loops, a button and zip fastening, two front and back pockets and a small coin pocket. 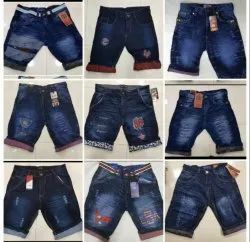 Being one of the extensive dealers of several kinds of quality garments, we are also indulged in wholesaling, trading and exporting these supreme quality denim shorts. These shorts are manufactured in developed and advanced industries using excellent quality raw materials. We are one of the leading exporter of Mens Shorts that are manufactured using quality raw material and have state of art stitching by our vendors. The apparels are available in different colors, designs and sizes. R. P. Exports Pvt. Ltd.